It’s been a while. But I’ve been working. Honest. And I’ve got a new book to prove it. A little book that, hopefully, will be the harbinger of the bigger one, of The Novel. But I’m loving the smaller book at the moment, the intimacy of creating one and also reading them (Annie Ernaux’s Simple Passion is beautiful). Trees at a Sanatorium is the new book and it’s part of Sylph Edition’s new series of booklets exploring masterpieces of 20th Century British Art. You can read more about the series here. My story is a fictional meditation on Mark Gertler, on his desire to paint, his struggle with TB, and his love for the artist Dora Carrington. 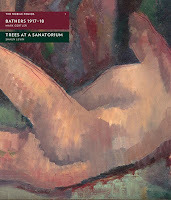 The piece was originally extracted from my novel-in-progress based on Gertler’s life, though during the process of working with the publishers, it became a bit like a satellite that has detached itself from the rest of the novel and now exists as an independent creation, orbiting Gertler’s painting “The Bathers”. It’s been a real joy working with Sylph – and although I haven’t seen the book yet (it’s at the printers), I have read quite a few of their other booklets and they are all stunningly beautiful. It’s so rare to come across publishers (especially small publishers) who are as interested in the writing itself as they are in the book as an aesthetic object, which, really, is about the reading experience. Their books make you want to own books. Their Cahiers Seriesis a treasure chest. I’ve bought Trees at a Sanatorium a couple of years ago and still once in a while I take a look in it. Thanks, Frank. I’d recommend checking out the whole series – the publishers have created some beautiful books. Glad to hear you like Trees.